2018 – an opportunity to join one of the UK’s fastest growing Consultancy businesses…. Over the last 9 years Tinderbox has been changing the shape and outcomes for many SME’s in terms of business performance. 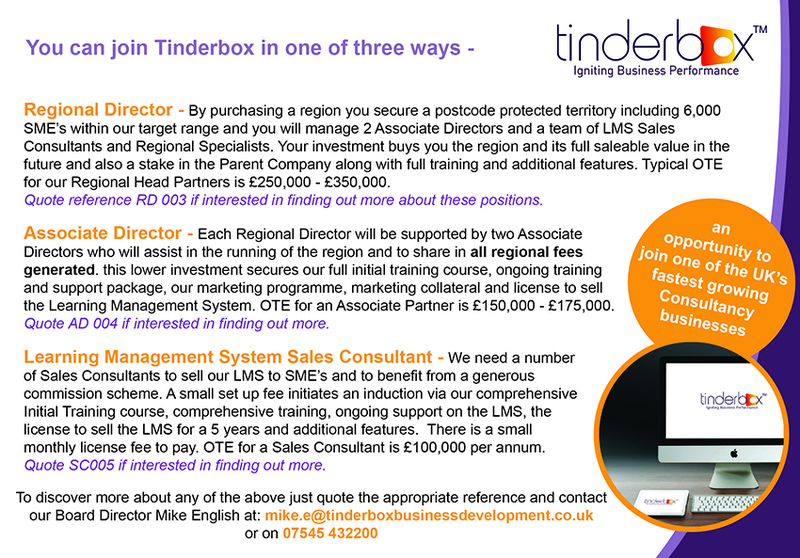 Almost 200 businesses with turnover from £2 million – £2 billion have benefited from our skilled and experienced support and advice which is provided by experienced Tinderbox personnel. Our relationship with major banks, accountants and legal firms provides us with a rich source of referrals and the referring organisations are always well pleased with and get great feedback on the work we do which enhances their business relationships. We have a number of Regional Directors already performing exceptionally well but we still have a few regions available for purchase. By purchasing a region you secure a postcode protected territory including 6,000 SME’s within our target range and you will manage 2 Associate Directors and a team of LMS Sales Consultants and Regional Specialists. Your investment buys you the region and its full saleable value in the future and also a stake in the Parent Company plus our full initial training course, ongoing training and support package, our marketing programme, marketing collateral, intranet access and license to sell our Learning Management System. Typical OTE for our Regional Head Partners is £250,000 – £350,000. Quote reference RD 003 if interested in finding out more about these positions. Each Regional Director will be supported by two Associate Directors who will assist in the running of the region and to share in all regional fees generated. The investment for an Associate Director role is approximately a third of that required for a full Regional Director role but this lower investment secures our full initial training course, ongoing training and support package, our marketing programme, marketing collateral and license to sell the Learning Management System. OTE for an Associate Partner is £150,000 – £175,000. Quote AD 004 if interested in finding out more. We need a number of Sales Consultants to sell our LMS to SME’s and to benefit from a generous commission scheme providing regular, guaranteed growing monthly income as our LMS subscription clients are signed up. Sales Consultants also benefit from commission on any additional consultancy projects that emanate from initially introducing the LMS. A small set up fee initiates an induction via our comprehensive Initial Training course, comprehensive training and ongoing support on the LMS, e mail address, insurance, invoicing and credit control and the license to sell the LMS for a 5-year period. There is a small monthly license fee to pay. OTE for a Sales Consultant is £100,000 per annum. Quote SC005 if interested in finding out more.